Overview: The Brittany is a very active breed. Eager to please, this dog enjoys work or any family activity that lets him know he's the center of attention. If he can get a rigorous daily workout, he'll be very content. Coat: Hair is either flat or wavy. Character: Brittany Spaniels are very athletic and intelligent. Always quick and curious, they're a fun family pet. Temperament: This breed gets along well with children and most household pets. Care: The Brittany Spaniel requires regular grooming with a brush. Training: This breed is very intelligent, so learns easily. 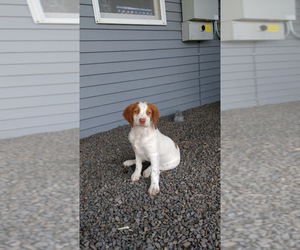 Activity: The Brittany Spaniel needs at least an hour exercise every day. It is not enough to go for long walks, but is better suited for running freely and playing in field sports. 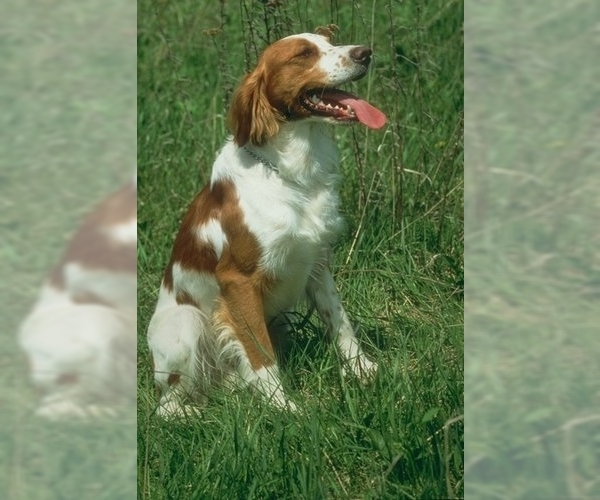 Health Issue: This breed is generally healthy, but may be prone to hip dysplasia and seizures. Healthy litter of 7 puppies born on January 18th. 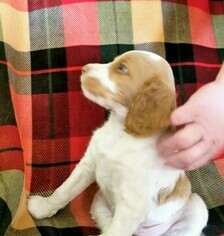 Only one beautifully marked male left. Dam and Sire both come from champion bloodlines.